During the 1800s, when European invaders were exploiting the riches of the African continent, art historians were “astounded” at the richness and variety of African art. They had no knowledge of such venerable cultures as the kingdoms of Ghana or Mali. The astonishment was particularly true in Nigeria, home of ancient, sophisticated cultures such as the Yoruba, the Edo, and Benin. They were flabbergasted that realistic art had dated in Africa in the distant past beyond Africans’ first contacts with Europeans. When the British burned and sacked Benin, the capital of the Benin Kingdom, in 1897, they hauled loads of bronze sculptures and ivories back to England. This started the mania for trade in African art among Europeans. They were most agog at the fabulous bronzes, now legendary, incapable of believing that Africans had such sophisticated culture so far back. They theorized that the Edo people learned bronze casting after some mysterious contact with Romans or Greeks who had invaded Egypt and North Africa. As far as I know, the Romans gave up trying to penetrate Africa in the 60s CE when they were looking for the source of the Nile, somewhere in Sudan. This head from Nigeria shows that while Europe was in the Middle Ages—a period when sculpture emphasized the spiritual rather than physical realism—African art was as sophisticated as anything produced in ancient Greece and Rome. The Yoruba of southwestern Nigeria have a long, distinguished history. 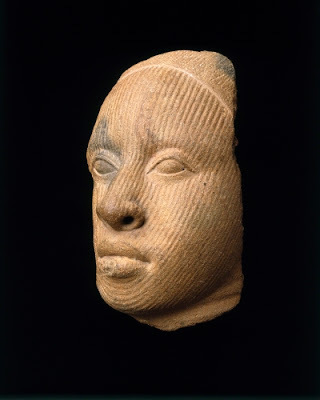 They trace their origin to the city of Ife (Ile-Ife), the location where the Yoruba’s first king (oni) Oduduwa immigrated around 1000 CE, possibly from the East, and established a line of kings that ruled the Oyo Empire. The empire endured until around the early decades of the 1800s when fractious civil wars sapped the strength of the Yoruba leaders and left the Oyo lands ripe for conquest by the British in the 1890s. This terra cotta head, most likely representing an oni, shows that Yoruba sculpture was already highly developed one thousand years ago. Ife court art interprets the human figure with a sensitive, stylized naturalism. The head is not meant to represent an actual person, but shows a person in the prime of life, bearing all of the features considered ideal beauty, with facial decoration that indicates status. As was the case with the bronze oba heads of the Edo and Benin people, these heads are believed to have been made to commemorate a deceased king, and thus were housed in a special palace shrine. If anyone needs another example of African art that didn’t need ancient Greece or Rome to inform their artists about realism….how about EGYPT? 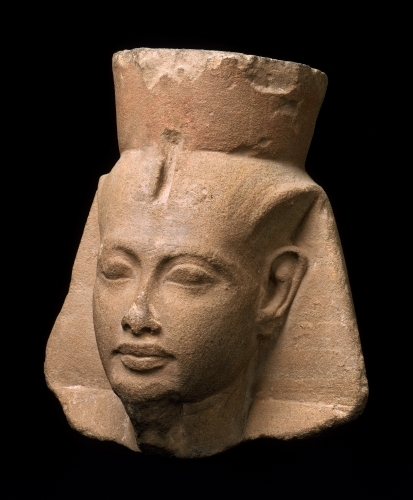 This head of Tutankhamun is a relatively late example of Egyptian realism, but I chose it because of the regal, stylized realism of the head that I think is similar to the Yoruban head. This head was produced way before Greece and Rome had their classical periods. If Yoruban realism was not an indigenous development, I would vote for influence from Egypt, not ancient Greece of Rome.